Remington B27597 870 Express Rifled Deer Barrel - 12GA. - Mount - 23" FREE SHIPPING! Home > Remington > Gun Accessories > Gun Grips & Accessories > B27597 870 Express Rifled Deer Barrel - 12GA. - Mount - 23"
Remington B27597 870 Express Rifled Deer Barrel - 12GA. 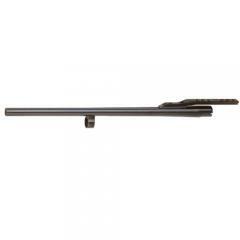 - Mount - 23"
B27597 870 Express Rifled Deer Barrel - 12GA. - Mount - 23"
The 870 Express Rifled Deer Barrel fits the Remington 870 Express 12-gauge shotgun. The 3-inch chamber design is compatible with Super Magnum, Magnum and 2.75 inch receivers, handling 2.75-3 inch shells. The vent rib construction allows for improved eye alignment and aim, while a matte finish reduces reflection and glare.The barrel includes a cantilever scope mount for secure attachment of optics. Measuring 23-inches long, Remington's barrel is incredibly portable for a day spent hunting in the woods. Note: Allow 4-6 months for shipment and delivery from the manufacturer. ©2002-2019 CopsPlus.com: Remington B27597 870 Express Rifled Deer Barrel - 12GA. - Mount - 23" FREE SHIPPING!